Today I sort of renewed my membership to the Ten Club. I said ‘sort of’ because sometime ago my membership has already lapsed but did nothing, but that doesnt mean I dont love them, I have all their albums and how can you ever forget your first ever rock concert anyway? Now with the new album coming out very very soon, the band will also have their scheduled European tour and they might just be stopping by the city of London, which is what I keep saying, “the new Seattle”, and somebody has got some vendetta on yours truly. Hey ho, I look forward to the upcoming gigs and another upcoming one in April 20. Pearl Jam will play its first U.K. show in six years on April 20, when it will drop by the 1,600-capacity Astoria. Tickets go on sale tomorrow (March 30) in the United Kingdom; a limited amount of tickets will be available to U.K.-based members of Pearl Jam’s Ten Club fan organization. 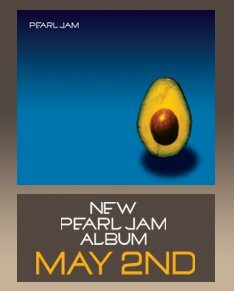 An extensive European tour is in the works for later this year in support of Pearl Jam’s self-titled album, which is due May 2 via J Records. First single “World Wide Suicide” is in its second week at No. 1 on Billboard’s Modern Rock chart. The track is also No. 2 on the Mainstream Rock tally. I have yet to download the single called “World Wide Suicide” with “Unemployable” on the B-side but I heard that it’s very radio friendly and very, very good. I can see it now, a song entitled Feigned Mischief, how utterly flattering. stone!!!! what do you want from me???!!! i’m happy now where i am. go away. please play emissary for me again, will ya? Tickets to the PJ gig at the Astoria have sold out within 20 minutes. Richard, how are ya! I tried your suggestion and youre right! The prices they are selling/bidding it is an obscene amount at £525 the last time I checked. When it was a measly £29.50/ticket had I only called earlier. Oh well, Sheila’s right, they’re back in the summer and as a Ten Club member, I have priority tickets. But still!!!! My nephew has tickets for the Eagles and Red Hot Chili Peppers. I don´t think he has place for Pearl Jam, pity. Anyway, this time I am not going with him. Time to fly! Here’s another PJ fan, hi Pedro! Anyway, have you told him about the new PJ album? If the band is going to do a gig in Spain, do you think you two might want to go? I have an extra ticket when the band starts their tour in August, you can use it and you can join me, my sister and whoever her date is. Think about it yes? 😉 Then we will be groupies afterwards! Oh – it’s so sad because they are also playing with Sonic Youth – how I would love to see them too!! Have you downloaded World Wide Suicide yet?? It’s fantastic! Think updated Versus sound…I simply can’t wait to listen to the album. Nice of you to finally visit and well, say something! Oh! Is there no other way for you to catch any of their shows somewhere else?? ?